Our inventory of new, used and vintage boards is unmatched! Kimo’s Surf Hut floor is made up of surf boards (each with their own story), stand up paddle boards, and all the accessories you’ll need to get you going or to change up your ride! There are surfboards for every wave. Visiting the island and getting out into the surf, you’ll find that like the waves – no two boards are alike! Kimo understands the demands and respect involved with the famous North Shore waves as well as those waves South off Waikiki. Kimo’s offers the right surfboards that can handle every level of surfing ability. We focus on hand shaped boards made in Hawaii. With a staff of shapers, we work with you and the type of wave at your favorite break to personalize your board for your needs. Family owned and operated, Kimo’s offers only the highest quality personalized customer service. At Kimo’s Surf Hut we’ve got “EVERY BOARD for EVERY SURFER, for EVERY BREAK”. 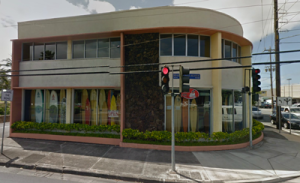 Kimo’s Surf Hut is located in the heart of Kailua, on the Windward side of O`ahu. Find us at the corner of Kailua Road and Kainehe Street: 776 Kailua Road. We’ve got free parking in the back! welcomed with aloha and made to feel like `ohana! Kimo’s surf boards, stand up paddle boards, accessories and apparel is easy to shop right here online or direct in the shop. We ship domestically and globally and all shopping is processed safe and efficiently through Payment Card Industry Data Security Standard (PCI DSS). This is a fancy way of saying we have secure way to accept credit card payments. We cater to our client’s individualized needs and can show vintage boards, as well as, other product’s condition via video upon request. If you are off island, we will ship it to anywhere you are around the world. For our customers on the neighbor islands, we drop off COD at YB for FREE.